I enjoy putting the unexpected into my everyday things, adding a little beauty to the routine. 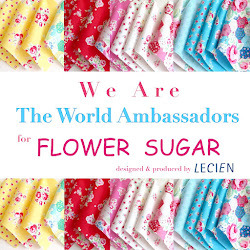 So I sew pretty fabric on plain kitchen towels, use pretty old tea cups as scoops in my flour and sugar, keep my onions and potatoes in a vintage bread box, store jewelry in porcelain bowls and mouth wash in crystal decanters, to name a few. 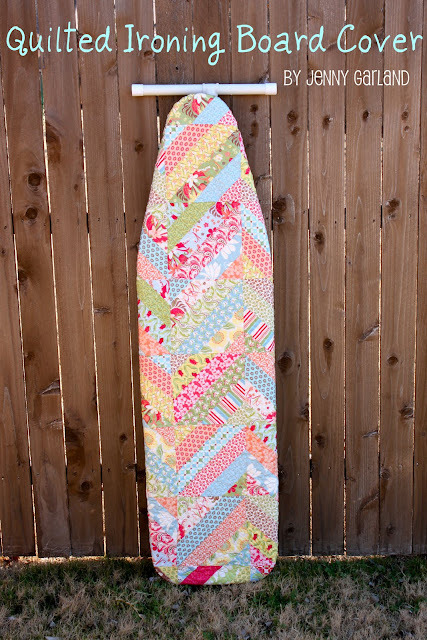 When I saw this ironing board cover in the Moda Bake Shop, I knew this would soon be my new sewing project. The patterns on this site are free and downloadable. It seems to happen every couple of years that my cover becomes stained with starch and grime of some sort. I even noticed that my ironing board seems to be a bit warped all of a sudden. So before I can make this cute cover I have to get a new ironing board. I was hoping you could tell me a good brand or style of ironing board for a quilter? My friend, Sally, wants to know if anyone knows where she can purchase clean bulk buckwheat for sachet making? Renee, I love my ironing board. Until a couple of years ago, I still had the one I received at a bridal shower...can you believe how bad it was. (about 40 yrs old) I bought my new one at Target. It is so sturdy and a little bigger than others, so you might have to adjust the cover if your make one, but I love it. I love the cover from Moda...will check it out. My cover is so bad I would be embarrassed for you to see it. I have a piece of muslin over it and it is even bad. I hope to see yours with a new cover soon. Beverly, I would be embarrassed for you to see mine too! mouth wash in a crystal decanter....genius! You should do a whole post on these pretty ideas. I love it! I have bookmarked the same pattern~ I love it!! What great ideas. I am going to have to bookmark this post so I won't forget! Stopping by from SITS. Thanks for visiting my blog. I love this cover...and I need one so bad. My ironing board is the one my grandmother had and the cover is probably just as old. Thanks for sharing the pattern link. I just recovered my ironing board, but it wasn't quilted. I just used a really cute fabric to go over my cover. About the buckwheat....try a feed store. She ought to be able to find it by the 50 lb. sack.